With the MiLB season over, it’s time to look forward to next year. I can do this with some good ol’ American plagerism-ripping of MLB Network’ Prime 9 show for a littlle countdown of my own. Narrowing the list to just nine parks wasn’t as easy as I thought, but here we go. 9) Fox Cities Stadium-Appleton, WI: Wisconsin Timber Rattlers/Class A Midwest League. Picking number nine was the hardest of all. Fox Cities Stadium barely beat out the ballparks in Dayton, Cedar Rapids, and Charleston, respectively. The stadim itself isn’t huge, with a capaicity of only 5500, but it’s a nice place to watch a game. The fans gave this ballpark the egde, with it’s spacious parking lot perfect for tailgating. And Wisconsin fans love to tailgate. The beer and the brats are always perfect for a game, before and after. The affiliation with the Milwaukee Brewers has really helped the atmosphere here, and the attendance. The park itself is basic, with no real site lines, but not a bad seat to watch baseball. The park is very easy to find, but with only one entrance and exit, there might be a wait. 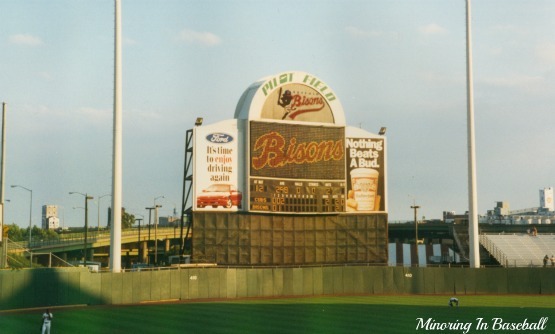 8) Pilot Field-Buffalo, NY: Buffalo Bisons/Triple A International League. Now called Coca-Cola Field, Buffalo is a major league city with a nice minor league park. At a capacity of almost 21,000 it’s a good sized ballpark to watch a game. There are still no bad seats in the house, though, and the sightlines of the city are pretty awesome. We always got there by train, so I’m not too sure about the parking situation. The concessions are good and there is a resteraunt in the right field area. The Bisons draw a good crowd, which is probably even better now that they’re affiliated with the Mets. I was able to watch the Bisons play here in 1993 along with some of the World University Games matchups. If I can ever find my pictures I took back then, I’ll scan them and get one put up. Until then you can check it out here. This is probably as close as you can come to a major league feel for the minor league price. 7) Fifth-Third Field-Toledo, OH: Toledo Mud Hens/Triple A International League. Opening in 2002, this ballpark is great all round. It’s carved into the downtown, and even has and area of seating in right field called the ‘Roost’ which is attached to a neigboring building. These have been dubbed the best seats in Minor League Baseball. The sightlines of the downtown area arn’t quite as good as Buffalo, but are more than enough of an eyefull. The seating is great, and the prices are very reasonalbe. We paid $8 and sat behind the dugout. You can’t really beat that. Parking is tough because it’s right downtown, so get to the park early, and even eat at Tony Paco’s accross the street, who you’ve might have seen Klinger on MASH talk about. Of all the the stadiums, this is one I’d love to visit more often. Throw in the fact that the Hens are the Tigers affiliate, and it’s a winner in my book. 6) Baseball Grounds-Jacksonville, FL: Jacksonville Suns/Double A Southern League. The Baseball Grounds was like my second home in the summer of 2005 when I was training in southern Georgia for over four months.Being at the ballpark was about the only thing that could take my mind off the fact that I was missing my wife and kids hundreds of miles north in Michigan. Add to the fact that it’s a great ballpark and the Suns won the Southern League in 2005, and this could easily be moved up on the list. The park holds about 11,000 and is nestled next to the Jaguars Alltel football stadium and Jacksonville’s indoor arena. It’s located right on the river and has great seating. Solid promotions and cold beer make this one of my favorites also. This is another parks I wish I could find my pictures of, but here are some good pics of it. 5) Louisville Slugger Field-Louisville, KY: Louisville Bats/Triple A International League. The front of the stadium is unique, as it’s built into an old train depot, which they also built two resteraunts into. The seats are great on right on the field where fans like them to be. It sports a large concourse and a huge party area in the outfield for all of the drinking crowd. The kids park is really put together nicely, too, with a carosel and all. Not much for sightlines, other than the bridge over the Ohio River. With the Louisville Slugger Museum/Factory down the street, this is a baseball experience every fan should take part in. 4) Modern Woodman Park-Davenport, IA: Quad Cities River Bandits/Class A Midwest League. USA Today billed this as the best Minor League ballpark in the country. It’s easy to get to and has one of the best views of probably any ballpark in the country with the brige over the Mississippi in right field. The concourse is set up so you can walk all the way around, which I like, and get a good view of the river and riverfront. The baseball atmosphere wasn’t as good as I thought it would be, which is why it didn’t make the top three. This is a must see for any baseball fan. 2) Fifth-Third Ballpark-Comstock Park, MI: West Michigan Whitecaps/Class A Midwest League. Yeah, I’m a bit of a homer here, but this is the list of my favorite ballparks. With a seating capacity of 10,000 it makes it pretty large for a Class A stadium, competitive with some Triple A and Double A stadium. It’s run and taken care of like a big stadium, too, with lots of unique concessions. The Fifth-Thid Burger was even featured on Man vs. Food last season. Located just north of Grand Rapids, there is a great atmosphere for baseball. The Whitecaps being a Tigers affiliate helps with that. All the memories of my kids and I here easily puts this ballpark toward the top of the list. 1) Grayson Stadium-Savannah, GA: Savannah Sand Gnats/Class A South Atlantic League. The reason historic Grayson is at the top of my list is quite simple. I just really really like it there. In truth, I have a love affair with the whole city of Savannah. I got a taste of it while down there training in 2005, then last summer I was actually stationed there for a week. Luckily the Gnats were in town, and I couldn’t get enough. The horrible pics I took with a disposable camera can not do this ballpark justice. It’s small and cozy, and as a baseball fan you just feel at home. You can actually feel the history of the sport sputter though you’re vains while watching a game here. It’s like actually taking a step back in time and seeing the game in it’s pure form. The brick exterior is classic baseball, while the weeping trees make it classic south. Nothing really fancty about the park, other than pure baseball. Savannah offers so much to look at, but catching a game here would be worth it.This is defiately a place I’d like to bring my kids down to someday. So, there you have it. Again, it was very difficult choosing just nine, but truth be told I have never been to a ballpark I didn’t like. Everyone is unique and meeting the great fans everywhere makes every team worth checking out. So that’s my Prime 9. What’s yours? Wow! What a list! And I haven’t been to any of them. But I would make a trip for a 5/3 Burger! From your pics it looks like every single one of these ballparks is worthy of being on a favorites list. They look like major league parks but with more charm! I’d go with Savannah too; it’s really beautiful. Jeff-the 5/3 Burger is on my list for 2011. Even if takes me and the three kids to finish it off. Jane-All the ballparks have their unique charm. I enjoy mingling with the local fans, too. Yes, Savannah is amazing. Pffff ~ Fugheddaboudit Louisville Slugger Field!!!! Woodman Park under the bridge is beautiful. Love the list; Love it. Add Brighthouse Networks Field in Clearwater and the Charlotte Stone Crabs’ stadium to your list. Those are beautiful stadiums with great tiki bars in ’em. Joyce has played a bit the last two games, but he sat out the start of the series because of the left handers pitching. I hope he plays against Lee, though. What bugs me about Joyce is that his defense has been ok and his baserunning has been poor. I really like the pic of the Iowa stadium with the bridge behind it – great shot! I’ve actually been to two of the ballparks on your list: Buffalo and Savannah. The Buffalo ballpark, which I think was called Dunn Tire Park when I was there, was nice but because it’s on the bigger side for a minor league park, just didn’t have that same intimacy. My family and I stopped in Savannah on the way home from vacation in Florida a few years ago, and it’s a nice historic ballpark. The one drawback (for me, since I like to take lots of game action photos) is the mesh fence that continues well past the infield. Nonetheless, an enjoyable ballgame. Brighthouse Networks Field is a really nice newer ballpark, as is Coca-Cola Park in Allentown PA (Lehigh Valley IronPigs). The Reading Phillies stadium is a really cozy older ballpark. They’re apparently renovating it this off-season; I just hope they don’t remove too much of its charm. Mike-you won’t be disappointed in any of those ballparks. The Mud Hens are a great time. RFB-I’d love to add Charlotte and Clearwater, I just have to make it back to Florida. I’d probably max out my credit card on Stone Crabs gear, though. I was pulling for the Rays, not only for Joyce, but for Brignac and Davis who also played Minor League ball in Michigan. Bob-I would love to visit the ballpark in Akron. One of my future trips will be hitting Columbus-Akron-Erie(PA)-Lake County-and maybe Cleveland or Toledo again. That would be a fun trip. Thanks for checking in.